This paper assesses the extent of the convergence of public policies purporting to combat racial discriminations in Europe by focusing on the cases of France, the UK and Spain. It shows that the influence of 'national models' remains powerful even when the implementation of a common policy instrument such as a European directive is at stake - in this instance the Racial Equality Directive of 29 June, 2000. Having outlined the reasons for focusing on this directive, we propose a synthesis of sociological and political science studies on the subject and present our comparative methodological approach in detail. We focus on the language employed to present the discrimination problem in all three countries under study. We first examine the French case and retrace the progressive evolution of the rhetoric used, from an emphasis on the fight against racism to equal opportunities and the promotion of diversity. Having thus observed the medium-term impact of national socio-political dynamics on a European frame of reference for action, we introduce a comparison with Spain and the UK, relying on documents produced by European institutions. 1.1 This paper adopts a comparative approach to assess the extent of language convergence and divergence in anti-discrimination policy in France, the UK and Spain, and explain these against the background of the historical development of the three countries' relations to migration/integration. We discuss the influence of national models on the use of rhetoric regarding the implementation of a common policy instrument such as a European directive. Rights – Raising awareness of the right to equality and non-discrimination and of the problem of multiple discrimination. Representation – Stimulating debate on the ways to increase the participation in society of groups that are victims of discrimination and a balanced participation of men and women. Recognition – Facilitating and celebrity diversity and equality. Respect – Promoting a more cohesive society. 1.3 Meeting these objectives entails creating the conditions for equality for all regardless of ethnic background, religion, gender, etc. It is therefore worth investigating whether the national discursive strategies devised in response to these European incentives differ from one country to the next, and if so in what respects and why. As the Racial Equality Directive is nearly fifteen years old, we now have the necessary hindsight to assess the extent to which it has contributed (or not) to the harmonisation of anti-discrimination and equal opportunity policies. In this paper we do this by conducting a comparison between three significant countries: France, Spain and the UK. 1.4 Our purpose is to examine the dynamics of the translation of a European anti-discrimination policy paradigm in three Member States with a particular focus on the language used to present the discrimination problem in each of these countries. The paper consists in five sections. We first present our methodological and empirical approach in detail. In the second section, we outline the reasons for focusing on the Racial Equality Directive in three various national contexts as a means to identify what is at stake in the Europeanisation of national public policies. Then, we propose a synthesis of sociological and political science studies on the subject to support our hypothesis. In the fourth part, we first examine the case of France, and retrace the progressive evolution of the rhetoric used, from an emphasis on the fight against racism to equal opportunities and the promotion of diversity. Having thus observed the medium-term impact of national socio-political dynamics on a European frame of reference for action, we propose a comparison of this case with the debates in Spain and the UK, relying on documents produced by the European institutions and combining a synchronic approach (on the year 2007) and a more longitudinal one using the reports of the European Commission against Racism and Intolerance (ECRI). 2.1 The methodology used for this research is based on the combination of three types of sources, collected since 2010 at European level in the Brussels and Strasbourg-based institutions and at national level in France, Spain and the UK. We picked these three countries because they are often perceived to represent three conceptions of citizenship in Europe. We first studied the French 'Republican' model, in which the government is in charge of reducing inequality by adopting so-called 'egalitarian' measures (Calvès 2002, Latraverse 2005). Second, we investigated the British 'multicultural' model in the UK, where difference is recognised in order to be better addressed through positive discrimination measures (Crowley 1992, Sales 2007). This model has undergone a number of changes in the 1990s (John Solomos  has pointed out the limitations of racial equality policies) and especially in the 2000s (Pilkington 2008). Lastly, we studied a model 'under construction' in Spain, characterised by the impact of regional specificities on the cohesion of a policy that is supposed to be national. We do have in mind that Spain in its current form was also designed for the purpose of obtaining membership in the European institutions after the fall of Franco's regime (García Flórez 2002), and that immigration occurred later there than in other countries (Delgado Godoy 2002, 2007; Peres 2010). Instead of treating these categories as monolithic blueprints – the 'differentialist' model traditionally associated with the UK vs. the French 'universalist' model –, our comparative approach allows us to examine how they change and overlap in discourses. 2.2 In each case, we have relied on a documentary review and on fieldwork. We have examined an array of official documents produced by EU institutions (statements of intent, studies, reports, directives…), Member States and institutions that promote equality, and put together a complementary press corpus. We have also conducted 21 in-depth interviews with members of associations, civil servants and public agents, academics, experts, etc. (7 interviews in France, 6 in Spain, 4 in Great-Britain, 4 in the EU's arena). We use some excerpts from these interviews to illustrate our discussion. 2.3 In order to collect this data, we have consulted the production of the European bodies in charge of monitoring and evaluating social and anti-discrimination policies. We have closely examined the reports of the European Commission against Racism and Intolerance (ECRI), established by the Council of Europe, and of the Fundamental Rights Agency (FRA), as well as Eurobarometers and the reports published by national equality bodies. These EU reports, produced by national experts, clearly reveal the differences thanks to their comparability: they have the same objective, the same framework and the same recipients. 2.4 Based on this material, we have attempted to evidence observable forms of convergence in the language used and references produced in the field of anti-discrimination policy, considering that rhetoric is an element of the strategies devised to circumvent the paths of dependency (Pierson 2000). 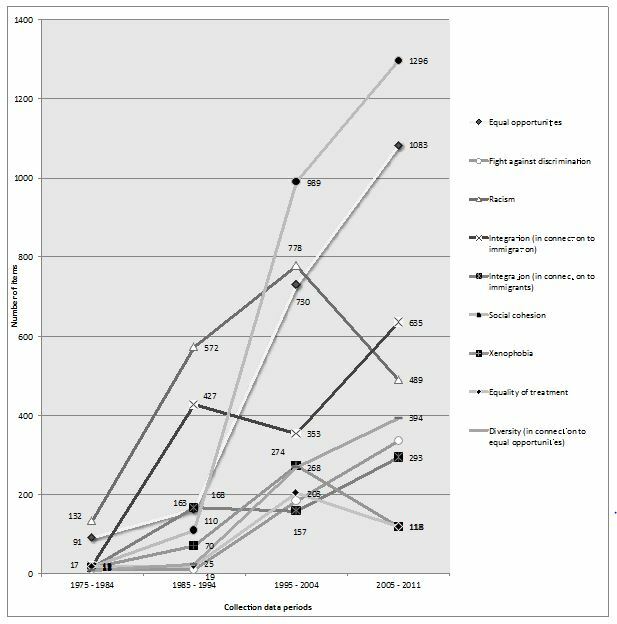 We propose the hypothesis that the history of the management of the discrimination problem in the three countries under study can be observed from the perspective of the different types of language used over time. Based on institutional administrative literature and on speeches of policy makers, we have evidenced a number of shifts in rhetoric strategies in anti-discrimination policy. 3.1 Numerous reports published by national and European institutions have shown that discrimination on the basis of origin is by far the most common form of discrimination. A 2008 Eurobarometer found that: 'of the six forms of discrimination examined […], discrimination on the ground of ethnic origin is seen as being the most widespread: 16% think that this is very widespread in his or her country, while 46% think that it is fairly widespread'. As far as expert networks are concerned, the president of ENAR also sees origin as the most frequent cause of discrimination: 'Unfortunately, […] the report shows that racial discrimination on the grounds of ethnicity continues to be one of the most widespread forms of discrimination in Europe'. 3.2 Having established this, is racial or ethnic origin a similarly widespread basis for discrimination in the three countries under study? According to the Eurobarometer, the perception of ethnic discriminations in these countries is higher than the average for all EU Member States (62%): France has a rate of 76% the UK of 69% and Spain of 66%. 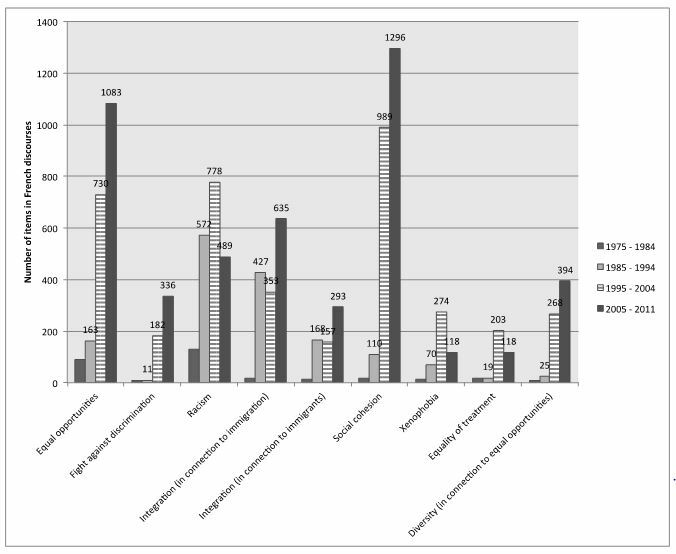 Whereas these numbers refer to perceptions only, close examination of the breakdown of complaints lodged to the French High authority against discrimination and for equality (HALDE) shows that complaints relating to discrimination on the ground of ethnic origin are indeed the most frequent. 3.3 In 2005, ethnic origin accounted for 38% of complaints and in 2009, 28.5% Even though a drop of 9.5 points in four years on the overall amount of complaints can be observed, origin remains the leading basis for discrimination in relative terms. In absolute terms, the number of complaints lodged for origin-related discrimination has increased over fivefold. The number of occurrences of 'origin' in the deliberations of the HALDE's Collège is another significant piece of data. Over the same period, out of 412 deliberations on 394 cases, this ground for discrimination appeared in 52% of cases, far ahead of gender. An expert of the French agency for social cohesion and equal opportunities (ACSé) with a long history of commitment against discrimination sees the increase in the number of complaints as positive: 'I'm seeing a more acute awareness of the issue, a more acute awareness of gaps and discriminations […]. Things are going far better because there are a lot more complaints' (interview, ACSé, Paris, 29 October, 2010). 3.4 In addition to the victims, the Eurobarometer's 2009 survey included witnesses of discrimination, who also mentioned ethnic origin as the leading cause of discrimination. In Europe, 26% of respondents claimed to have witnessed discrimination (of any kind). Racial or ethnic origin is the most often mentioned basis for discrimination (12%), ahead of age (8%). Considering that all sources concur on this, it appears that in order to achieve equal opportunity, public policies must act against discrimination based on origin. This is why we have decided to focus on this specific form of discrimination: on the one hand, it is widespread in Europe regardless of the national context where it manifests itself; and on the other hand, racial or ethnic discrimination indirectly relates to immigration issues and national integration policies. We begin by examining the three different national immigration models in order to understand how the authorities have addressed the discrimination problem over the years. 3.5 France is a country of immigrants. However, the country does not recognise ethnic communities: 'the specificity of the French system consists in aiming for […] the production of well-integrated citizens, who once they are national citizens are no longer identified by their origin' (Weil 1995: 493). The very concept of race is taboo in France; Erik Bleich (2000) calls this the 'French paradigm of racial neutrality'. The French government has conducted anti-racism policies without ever mentioning the word race. As an expert from the European Network Against Racism (ENAR) told us during a discussion on ethnic statistics: 'There's a major debate about this, actually. Sure, there's a sort of resistance from the French organisations on that issue' (interview, Brussels on 11 January 2011). 3.6 While two 1972 and 1990 laws respectively introduced and then reinforced sanctions for racist offences, in 1999 the creation of the Groupe d'étude et de Lutte contre les discriminations marked a change in terminology - there was no more talk of racism, replaced by discrimination. In order to meet the obligation for Member States to establish an independent authority, the HALDE (Haute Autorité de Lutte contre les Discriminations et pour l'égalité) was created in 2005; the Défenseur des Droits followed in 2011. France has remained reluctant to introduce ethnic monitoring, an indispensible tool for the evaluation of indirect discrimination. In late 2009, the Comité pour la mesure et l'évaluation de la diversité et des discriminations submitted a report calling for ethnic statistics. This remains a thorny issue in France, however: 'The measure of discrimination is a politically sensitive and methodologically complex subject' (Safi and Simon 2013). We must keep this context in mind while analysing the terminology of French anti-discrimination experts. 3.7 With the steady stream of immigrants that followed the UK's decolonisation process and the increasing awareness that these migrants had settled permanently, the government began restricting entry and residence in the 1960s (Carles 2008). To then Home Secretary Roy Jenkins (1966), integration required respect for cultural diversity, equal opportunities and mutual tolerance. Thus the UK officially recognised ethnic and religious communities, and the fight against discrimination became a core feature of the management of immigrant minorities (Guiraudon 2004: 11). 3.9 In the UK, the government has always held the view that if you have a law against discrimination, then you need a committee and an equality body to help and advise people on what they should do about the law; to advise employers, entrepreneurs, service providers, to help civil society so that they know what to do (interview EDF, London, 7 March 2011). 3.10 In order to meet European requirements, British legislation was transformed until 2010, introducing more discrimination criteria in a wider array of fields. Additionally, public institutions and bodies have new obligations to achieve equal opportunity. 3.11 While there was an identifiable tradition of anti-discrimination policy in the UK, the European directive coincided with an important political juncture. The New Labour's rise to power in 1997 signalled a change of orientation regarding the question of equality, which was rethought as 'equal opportunity rather than as redistribution where communautarianism was a tool for attaining social cohesion'. Nisha Kapoor noted that 'where Thatcherism had framed its dismissal of urban unrest in terms of it being an attack on traditionalist notions of "Little England", Blairism emphasized the assault on "modern" multicultural Britain' (2013: 1032). Nikolas Rose suggested that 'race, ethnicity, gender and sexuality carried the potential to disrupt attempts to impose a single set of moral principles through communitarian policies' (1999: 480). When the British government grants subsidies to two Muslim schools, it implicitly recognises religious communities – not merely ethnic ones (Lemosse 2000). A step forward was taken in 1999 with the Macpherson Report, which acknowledged the existence of an institutionalized racism. This document prompted the Race Relations Amendment Act of, 2000 breaking 'important new ground in including a positive legal duty on public authorities to promote racial equality' (Fredman 2001). 3.12 While the UK has a long tradition of anti-racial discrimination policy and monitoring instruments, this is not the case of Spain. During the twentieth century, Spain, unlike France and the UK, was considered as a land of emigration towards Europe and its former South American colonies. After the fall of the Franco regime, in 1978, the country was democratised and opened to Europe. In 1986, Spain became a member of the EEC. The EEC's regional funds helped the country's economy to grow, and as a result of its economic attractiveness, Spain became a land of immigration in the early 1990s. The novelty of this immigration made Spain virtually 'neutral ground' for the implementation of an immigration model without a well-established path of dependency. There was no tradition to clash with the European anti-discrimination paradigm. Yet, the steady arrival of numerous immigrants on Spanish soil between 1985 and 2008, the country's lack of experience and institutional resources made integration and anti-discrimination policy a real challenge for the government. A member of Amnestia International (AI), one of the leading Spanish organisations on the subject of discrimination began our interview by pointing to this inexperience: 'Our point of view is that the authorities lack awareness of the scope and of the nature of discrimination in Spain. It has been an invisible issue because there's no data on it' (interview, Madrid, 2 March 2011). 3.13 These reasons explain the delay of Spanish authorities in transposing Directive 2000/43/EC into law, even if Spain was considered as the EU's 'good student' and faithful supporter (Larroque 2010: 78). The first Spanish equal opportunity body was only created in 2007, and it still has limited powers and financial resources compared to its French and British counterparts. 3.14 The European directive is therefore implemented in very different national contexts. Managements of discrimination at the national level have varied according to the countries' histories of migration and chosen policies. Based on the study of European literature, we set out to establish whether a rhetorical convergence occurred after the transposition of the European directive. Europe is still a driving force because it has set a general framework for the fight against discrimination. Then you have the transposition of these directives into domestic law. […] No single country's a driving force for that. But in each country, according to their specificities, there is a will to be able to work on this issue (interview with a trade union member and ETUC representative, Paris, 11 January, 2011). 3.16 The issue at hand here relates both to the concrete signification of a convergence process and to what is emphasised by States when they address national integration. In both cases, what is at stake is merging two approaches of boundaries (Hamman 2013): the most visible one relates to the institutions – particularly national borders – while the other is more symbolic and relates to socio-economic boundaries. Combining these registers allows us to analyse how national spaces and their institutions are shaped in multiple ways by migrations and circulations. We can better understand in what terms the question of the public treatment of ethnic discrimination is posed, as well as that of the social and political construction of immigration as the 'immigration problem', in the words of Abdelmalek Sayad (1999). The discourse on 'integration' – which defines the issue of immigration as first and foremost a problem with the immigrant, hinging on his ability or eagerness to assimilate – can accordingly be rephrased under the angle of the processes of construction of ethnic boundaries in the host society (Sala Pala 2013: 22 sq. ), of which urban policies can contribute to the (re)production (Cross and Keith 1993). 3.17 For the public authorities, the figure of the immigrant doubly blurs established boundaries: between the national and the stranger (in the sense of the non-national), but also between the legitimate national and the illegitimate national, which has resulted in an official line in which references to ethnicity tend to be perceived as dangerous and either denounced as such or suppressed. Policy-makers do not merely grapple with the discrimination 'problem'; they also participate in the production of ethnic boundaries as socio-political constructs, as Norbert Elias has eloquently shown (1965), between insiders and outsiders. 3.18 In practice, it is impossible to separate the representations and interventions of policy-makers from the categorizations that have been disseminated in society, following different temporalities. Public actors de facto contribute to legitimising and disseminating these categories, a porous process that involves reciprocal interactions. Didier Lassalle (2006) established this when he considered the evolutions of the 'ethnic question' – What is your ethnic group? – in the British census between 1991, 2001 and 2011, in function of the pressure put by diverse groups to adopt new phrasings. In these censuses, as they answer the question, respondents are free to limit themselves to one ethnic self-identification, to pick the 'other' category and fill in the description that suits them or to ignore the question altogether. This leaves room for arrangements and for incrementalism. It is also in such processes that the notion of 'origin' can be replaced by hybrids that are carried into the elaboration of social policies. 3.19 In general terms, we may first speak of a normative convergence: the directives impose an objective and a framework. However, due to the subsidiarity principle, each Member State is free to use whatever instruments it chooses; the only obligation is to meet the objective set by the European institutions. This also requires the convergence of policy goals. On which aspects can such a convergence be observed? On policy content, on the instruments, on the outcomes and/or on the political 'style' employed? This question is all the more important as each country has its own history of anti-discrimination policy (see Bleich 2003; Sala Pala 2013; Frank 2014). 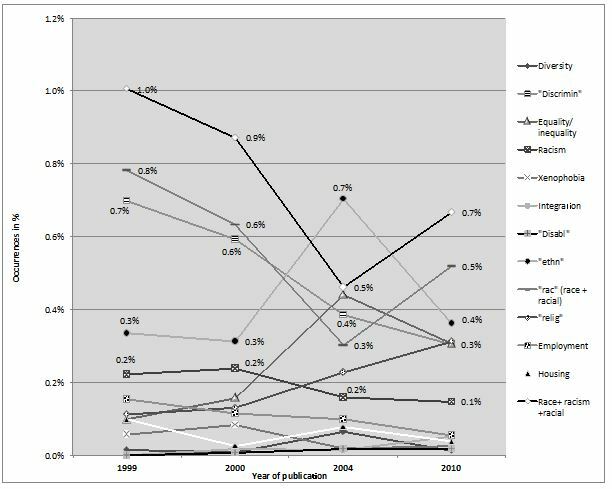 4.1 Comparative research on national anti-discrimination policies in Europe initially focused on questions of socio-spatial segregation related to urban housing (Blanc 1990; Blanc 2003; Solomos 1991). Then, as it addressed the relationship of these policies with the standards produced at European level, the literature recognised that the Racial Equality Directive induced convergence effects, while also pointing out the limitations of this process. 4.2 In their study of the genesis of the directive, Andrew Geddes and Virginie Guiraudon noted the paradox inherent in the quick creation of a new binding standard for States whose legislations were until then not very compatible; anti-discrimination policies strongly differed across Europe as each country had a different philosophy on integration (Geddes and Guiraudon 2006). 4.3 For his part, Christian Joppke (2007) clearly identified a dynamic of convergence despite the supposed existence of national integration models. In his examination of integration policies in the Netherlands, Germany and France, he observes that integration policy has become an instrument of policies designed to curb immigration. More specifically regarding anti-discrimination policy, Jacques Chevallier (2003) also noted that 'policy responses tend to converge, owing in part to the pressure of Community law, leading to the progressive construction of a common core and thus strengthening the community of values that underpins European construction'. Woehrling makes a similar observation from a comparative law perspective: 'Faced with the requirement of implementing European standards, European states have developed increasingly similar anti-discrimination legislations' (Woehrling 2008: 59). 4.4 The French 'model' of citizenship has in particular been described as the furthest from the European paradigm: 'The fight against racism cannot be distinguished from the conception of the stranger. […] In France, no distinction is made between the individuals, who are all subject to the authority of the Republic, and most naturally the fight against racism involves common law channels' (Haguenau-Moizard 1999). In this sense, the equality of rights defended by the French state is antagonistic to the European conception of equal opportunities because, as Daniel Borrillo explains, 'the goal of the European Union [is] not so much to achieve actual equality, but rather to create the conditions for genuinely equal opportunities through an effective anti-discrimination policy – not only in cases where the intention to discriminate has been proven (direct discrimination) but also in cases where, without discriminatory intent, arbitrary concrete effects put an individual or a group of individuals in a less favourable position (indirect discrimination)' (Borrillo 2003: 141). 4.5 Yet, even in a country whose integration model is supposed to be the most remote from the European blueprint, several scholars have posited the hypothesis of the Europeanisation of the French integration policy following the transposition of the Racial Equality Directive. This includes Virginie Guiraudon (2004), who like Patrick Simon, argues that 'the European action framework tends to converge with those set up for nearly thirty years by the US and the UK, and for twenty years by Canada. This convergence is owed for the most part to the spread of the legal concept of "indirect discrimination", a source of one of the key trends in matters of non-discrimination and promotion of equality' (Simon 2005: 14). The author also notes, however, that statistics (including ethnic statistics), which are the main tool used for identifying indirect discrimination, are used unequally in European countries. This constitutes the first limitation of this convergence phenomenon. 4.6 More recently, Jimena Larroque Aranguren has argued that France's commitment to the fight against discrimination can be read as a sign of European convergence (Larroque Aranguren 2010, chap.1). She has identified the existence of a direct relation between the anti-discrimination policies adopted and the models for the integration of immigrant populations. Lastly, Isabelle Carles (2008) contends that 'the fight against discrimination results from a social mobilisation process and from policies elaborated at international and European level' by EU institutions and civil society actors (NGOs, associations, expert networks; see also Frank 2014). The latter, according to her, have favoured 'the renewal of frameworks of thought and action at the national level, by enabling the circulation and the exchange of good practices'. This suggests that our analysis should consider the interplay between national and European levels. 4.7 We have therefore been attentive to new developments while accounting for aspects reflecting the continuity of public policy trajectories at the national level, i.e. bearing in mind the concept of path dependency (Pierson 2000), which reflects forms of resistance to change and the circumvention strategies that come with them. 5.1 We had two main reasons for focusing on France. The first was the distinctive French taboo surrounding the word 'race' (Simon 2006; Sala Pala 2013), leading to the development of discursive strategies to facilitate the transposition of a European directive that explicitly addresses race. The second reason owes to the wealth of material we collected on France. The French discourses were available online with a search engine, lending themselves well to useful statistical analysis. We did not have access to similar material for Spain and the UK. 5.2 Is choosing a type of discourse over another a result of the transposition of the Racial Equality Directive? The question deserves investigation, particularly regarding the phrases 'equality for all' and 'equal opportunities' that have come to prevail in the public debate. 5.3 In France, diversity and equal opportunities are terms that have been used only recently. Until 1997, the discussion revolved mainly around racism when salient events occurred. For instance, following a November 1983 assassination, government spokesman Max Gallo claimed on the evening news broadcast of Antenne 2 that he was determined to combat 'all forms of racism' and added: 'racism is a cancer that gnaws at the democratic foundations of a society'. The very name of the association SOS Racisme, founded on 15 October, 1984, is also significant. Funded largely by public money, this collective catalysed the political expressions of various groups of beurs against a backdrop of labour disputes in the car industry, publication of pamphlets openly opposing multicultural France (Wihtol de Wenden and Leveau 2001: 49), and threats from the Front National on the far-right end of the political spectrum. 'SOS Racisme pointed to a problem of French society; many French people were aware there was a problem but didn't know how to act. SOS made it possible to establish that framework', a vice-president of the association told us (interview, SOS Racisme, Paris, 26 October, 2010). 5.4 Then, movements spread from the fight against racism to the demand of more equality and a shift in the language occurred. The 'march for equality and against racism' that was met with indifference as it began in Marseille on 15 October, 1983 gathered momentum along with the anti-racism movement and made the news as it kept attracting more marchers. On 3 December, 1983, the national daily newspaper Libération announced on its front page that 100,000 people finished the march in Paris. Initially, we started out with 'racism' and then we ended up with 'fight against racial discriminations'. Then the word 'racial' disappeared and gave way to 'equality'. So we started out with racism and then you can clearly see the path that led us to fight all forms of inequality, and then to defend equality. […] In the meantime, the landscape changed dramatically. There was the introduction of the HALDE, the Diversity Charter, the transpositions of the European directives… (interview, CFDT immigration department, Paris, 10 January, 2011). 5.6 Subsequently, when the socialist government of Lionel Jospin, the Prime Minister from 1997 to 2002, established an action framework, the shift in language was clear. The fight was no longer on racism, but on discrimination. The first measure was the creation of the Groupe d'étude et de Lutte contre les Discriminations (GELD) in October 1999, conceived as an observatory of racial discriminations; the Commissions Départementales d'Accès à la Citoyenneté (CODAC), entrusted with the task of ensuring equal access to employment, also deserve mention. Although the term was not directly used as such, employment discrimination was the real target of this meritocratic Republican rhetoric. 5.7 The transposition of the Racial Equality Directive, which came into force in June 2000, was part of the same process that was extended until 2002, when the French law recognised the notion of indirect discrimination (Geddes and Guiraudon 2006). However, Patrick Simon and Valérie Sala Pala (2010) noted a tension between 'hard integration' and 'soft anti-discrimination'. In effect, an increasingly hard-line approach to 'Republican integration' was taken in the 1990s: a Ministry of Integration and a High Council on Integration were introduced in 1990. All these developments contributed to the public dominance of the anti-ethnic discrimination terminology. In light of these transformations in the language used to describe the issue and in the treatment of the problem, especially under the Jospin cabinet, some analysts have evidenced a 'requalification' of the French integration model (Lorcerie 2000). It doesn't mean anything whatsoever, the promotion of diversity! First, it has no legal content, nothing defines it. […] It's an 'umbrella' word that can mean anything and everything. […] Diversity can refer to persons with immigrant backgrounds. It can refer to the outcome of an equal treatment policy. It can refer to the infinite, human sources of variation in French society. And that's why it's so successful, because everyone can pull it in their direction (interview, ACSé, Paris, 29 October, 2010). 5.9 Far from being an obstacle to its diffusion, the fuzziness that surrounds the register of diversity makes it suited to federating divergent cognitive registers and practices, through what Neveu calls a 'cotton candy effect' (Neveu 1994: 88). It establishes a rhetorical framework that is adjusted to the conciliation of antagonistic interests, and ensures a shift from negative to positive language, from the fight against discrimination to the promotion of diversity, which in turn facilitates appropriations. 5.11 This representation of public discourse confirms the perception of the actors under study. The term 'racism' prevails in the 1975-1984 decade. We can also observe that mentions of racism are increasingly frequent in public discourses. This is still the case between 1985 and 1994, but the term 'integration' becomes increasingly frequently used (respectively 572 and 427 occurrences). Between 1995 and 2004, emphasis is put on social cohesion first, and then on racism (respectively 989 and 778 items). Over the same period, occurrences of 'equal opportunities' sharply increased. Lastly, in the last period under consideration (2005-2011), the use of 'racism' remains frequent, but 'social cohesion' and 'equal opportunities' are far more often employed. These changes in anti-discrimination terminology are outlined on Figure 2. 5.12 The statistical data shows that three occurrences have been less frequent since 2004: equality of treatment, xenophobia and racism. Conversely, two phrases prevail in public discourse: equal opportunities (combined with 'diversity and equal opportunities') and social cohesion. Laure Bereni and Vincent-Arnaud Chappe (2011) have explained that the use of the phrase 'promotion of diversity' in lieu of 'fight against discrimination' relates to its more consensual and positive character. This development relates to the rise of an 'individualist liberal scheme (equal opportunities) or the horizon of a collective benefit (diversity)' (see also Simon 2007; Bereni and Jaunait 2009). Speaking of social cohesion appears to be a way to circumvent the terminology of integration, which is associated with a specific category at the risk of stigmatising a single group (for instance, the integration of immigrants). 6.1 We have chosen to compare the language favoured in the UK, Spain and France in documents entitled 'National strategy and priorities for 2007' that present the initiatives highlighted by Member States within the framework of the European Year of Equal Opportunities for All. At a given time, we sought to determine if the terms used were similar or if national specificities existed in order to establish the existence or absence of a convergence. 6.2 In all three countries, the terms 'discrimination' and 'equality/inequality' are those most frequently used to refer to equal opportunities. The UK displays a marked preference for the terms 'equality/inequality', especially compared to France. As the documents are of an unequal length, we converted absolute values into relative values to confirm these findings, as is shown in Figure 3. 6.3 A number of differences can be identified from one country to the next. British authorities mention age more often in their presentation of equal opportunities policies. The UK addresses the general question of equality/inequality without necessarily associating it with equal opportunities, unlike France (0.71% of occurrences for 'opportunities' in France; only 0.10% for the UK and 0.55% for Spain). A key distinction lies in the low number of occurrences of the 'discrimin' root in the British text (0.47% of items), compared to the French text (1.31% of items). There are far fewer occurrences of 'employment' in the British document than in its French counterpart. In the UK document, the 'employ' root occurred mainly for 'employers', as a category that the authorities have to work with. Employers are seen as a political target to reach national goals. 'Employment' in general is also mentioned but only a few times. In the French document, the term 'employment' comes up more frequently because several institutions are in charge of anti-discrimination policy: the ministry of labour, an ad-hoc secretary and an ad-hoc commission. . . A link is made between unemployment and discrimination. In Spain, the focus differs. Employment and anti-discrimination policy are linked with the need to change the status and rights of workers. 6.4 The issue of race is brought up more frequently in the British document (0.28%) than in the French document (0.16%) and the Spanish document (0.14%). The gap is however relatively small and difficult to interpret on the basis of this data alone. 6.5 Other documents allow for comparison of lexical choices, including in particular the ECRI's reports. Although they are productions of the Council of Europe, the ECRI's periodical reports are inspired by reports written by national experts (from NGOs, associations, jurists…) and as such reflect the priorities of the policies implemented at the national level. For these reports, we have used the same methodology as for the 'National strategy' reports, which consisted in counting occurrences for each of the terms selected in each report. Subsequently, we related the number of items searched and the number of words included in each document in order to obtain exploitable relative values. Indeed, ECRI reports (particularly those regarding the UK) have become longer over the years. 6.6 The length of the ECRI documents varies between the three countries under study. In 2004 and 2010, the British reports were longer than the others due to the inclusion of responses by British authorities to the ECRI's conclusions, which were not featured in previous reports. We can also observe that over the years, all the national documents become longer. The body of knowledge on the fight against racial discrimination has expanded as the experts gained deeper insights and developed better arguments. The shortest documents are the Spanish ones, arguably a reflection of the fact that racial discrimination is still a recent policy preoccupation in Spain. 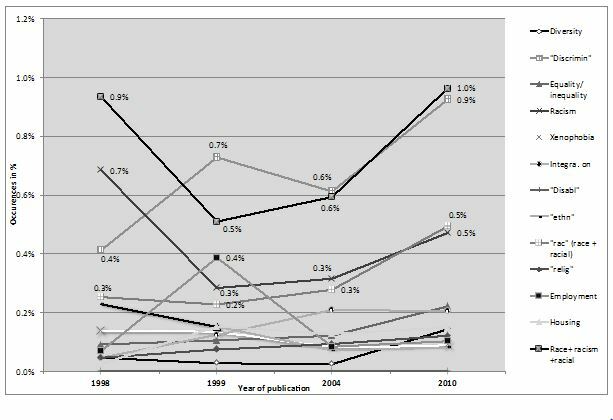 6.7 Figure 5 to Figure 7 show the language favoured in the discourse on anti-discrimination and equal opportunities policies since 1998 (the date of publication of the first ECRI reports) for each of the three countries under study. 6.8 As in the 2007 'National strategy' documents, the terms 'discrimin[ation]' and 'equality/inequality' feature rather prominently in all documents. The root 'rac' comes up more often in ECRI reports, which may be explained by that body's distinctive goals. 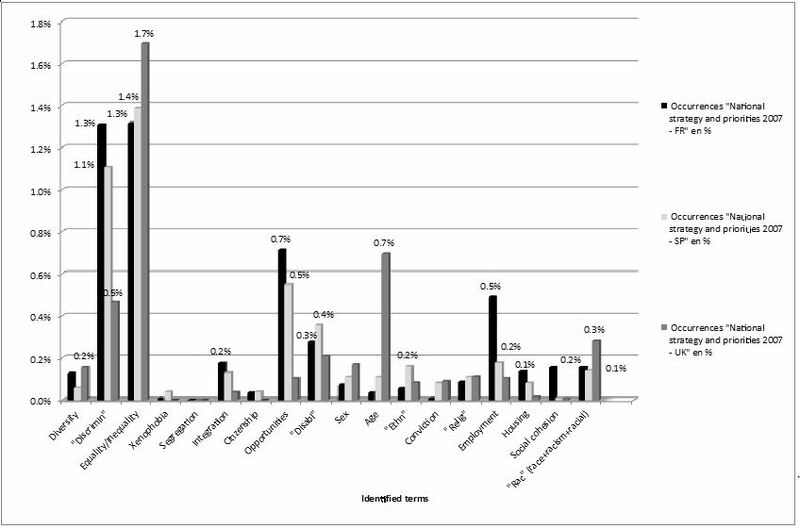 Longitudinal comparison of the use of the main terms employed in ECRI reports on all three countries allows for a finer analysis. 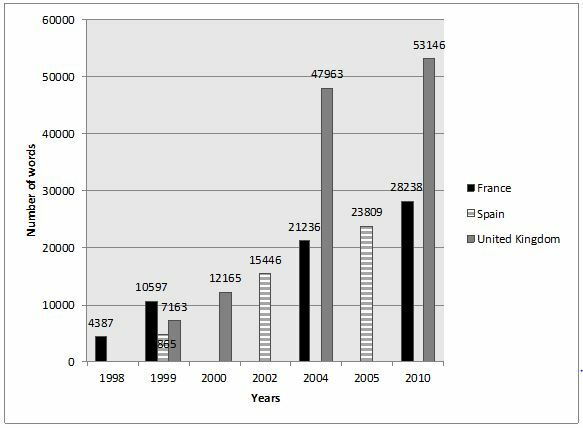 6.9 Since 1999, the root 'rac' has been increasingly frequent in ECRI reports on France, as have 'discrimin' and 'ethn'. Also worth noting is the introduction in 2010 of the term 'diversity', which was virtually absent from the 2004 report. This reflects the choices of political and economic leaders, in particular since the urban riots of late 2005 in the banlieues after the death of two youth in Clichy-sous-Bois. The state of emergency was declared for three weeks. The rioting, which went on for particularly long and attracted media attention abroad (Kokoreff et al. 2007), incited French authorities to reemphasise the fight against discrimination. In 2006, the rhetoric changed and emphasis was placed on the promotion of diversity. For instance, the deputy minister for the promotion of equal opportunity Azouz Begag organised the first 'Tour de France of diversity' from 9 October to 14 December. On 20 December, he announced: 'In 2007, diversity in the workplace will be one of three key areas of the French strategy for the implementation of the European Year of Equality for All'. The word was then taken up by Nicolas Sarkozy, who turned into a presidential slogan during his term. As Hervé Marchal and Jean-Marc Stébé (2010) explain, diversity involves multiple social fields, including school, the family, immigration, and numerous dimensions such as culture, sexual identities, ethnic origins and religion. It therefore relates to a very broad approach to the concept of vivre ensemble (living together), in which the public management of ethnic discrimination is never addressed outright. 6.10 In the case of the UK, the root 'discrimin' is found increasingly less both in the ECRI reports and in the document on the 2007 equal opportunities strategy. The term 'equality' is clearly preferred. Reference to 'employment' has become more infrequent since 1999. But it does not mean that discrimination at work gets less consideration in the UK, as Gay Moon, from EDF, told us: 'I think we have this sort of specialization in the field of employment. People understand discrimination and the judges in the industrial tribunals have the obligation to receive additional training for discrimination cases' (interview, London, 7 March, 2011). 6.11 The discourse is more general and less focused on a specific dimension. 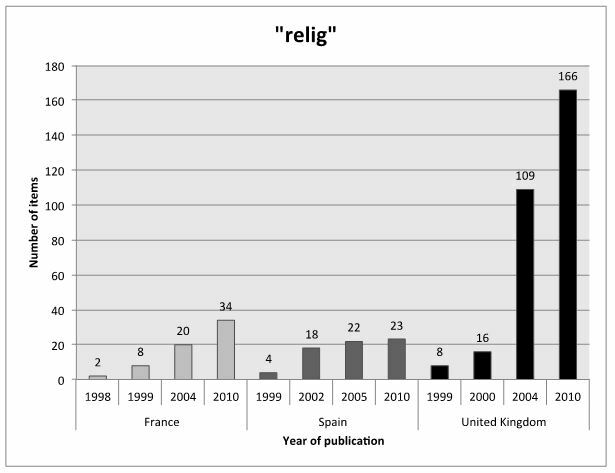 On the other hand, 'religion', which is not mentioned often in the French and Spanish reports, has been increasingly debated since 1999. Religious issues are more easily discussed in British public arenas than in France because of their historical choice of integration model. In UK public policy, unlike in France, 'religion' is not a taboo word. The reason for this is that British authorities have since the 1960s recognised religious and ethnic communities to facilitate their integration. The British integration model is based on open citizenship and acceptance. In France, the universal conception of the citizen causes religious and ethnic features of individuals to be considered as private. Any policy must take this into account. Moreover, as Sukhwant Dhaliwal explains, 'New Labour radically transformed the place of religious groups in the public sphere'. The role of religious groups has been extended by different means. In the field of our concern, equality legislation has included 'religious discrimination in employment and service provision through the Employment Equality (Religion and Belief) Regulations 2003 and through the Equality Act 2006' (Dhaliwal 2011: 48). The opposed conceptions of integration in France and the UK are reflected in public discourse on these subjects. The UK's ECRI report addresses religious and racial issues jointly. More generally, it is clear that in 2010, the authorities were genuinely eager to address religious discrimination as seriously as racial discrimination. Membership in a religious community was officially recognised. In the French ECRI report, religion is mostly addressed in terms of protection against discrimination because of the law banning religious symbols at school, reinforcing the secular nature of the French state. In the Spanish report, the lack of religious instruction opportunities is seen in the report as posing a potential risk of discrimination, a concern that arguably reflects the fact that many of the immigrants that came to Spain in the 2000s are young. Overall, attention to religious issues has increased in all three countries after 2000, especially in the UK in the aftermath of the 2001 and 2005 terrorist attacks. 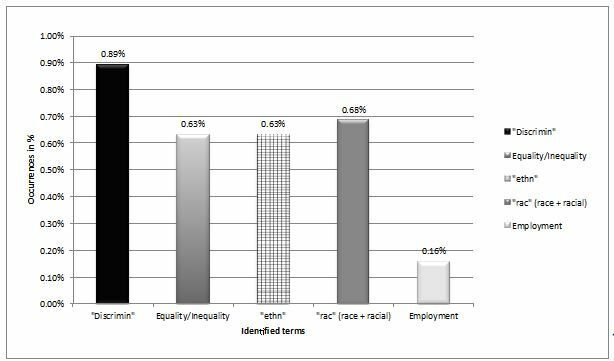 6.12 The most frequently used terms in the ECRI reports on Spain are 'discrimin[ation]', 'racism' and 'equality'. They are however found less often than in expertises on France and the UK; 'diversity' and 'equal opportunities' are for their part virtually absent. It appears that due to their lack of institutional experience in the field of discrimination, the Spanish authorities tend to reproduce the EU vocabulary. 6.13 In order to examine how the national policies implemented to transpose the European directive relate to that document, we now compare the above findings on the ECRI reports with the language used in Directive 2000/43/EC. 6.14 Figure 8 reveals a match between the vocabulary produced by the ECRI and the Racial Equality Directive. The roots 'discrimin', 'ethn', 'rac' and 'equality' are the most frequently used, with similar frequency rates on all figures. It is worth noting that the directive does not address racism, but racial discrimination. It makes no mention on xenophobia, citizenship, segregation or diversity. 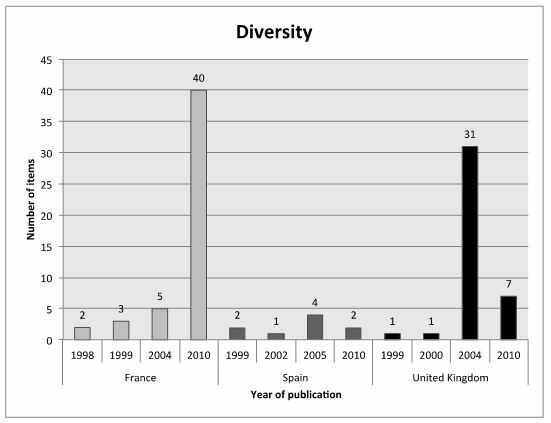 Yet, the latter term was heavily used in the 2010 ECRI report on France, as shown in Figure 9, which suggests 'diversity' is first and foremost a national rhetoric production. To a lesser extent, documents on the UK also use this register, but less so after 2010 as the 'relig' root became increasingly used. In the UK, ethnic diversity has become an important policy objective for the Labour government, particularly since the publication of the Macpherson Report in 1999 (Johns 2004). This may shed light on the rise of the term 'diversity'. 6.15 The most nationally distinctive terms include the root 'ethn', which is more often used in the UK than in France. Where in 2004, the ECRI report on the UK included over 330 occurrences of 'ethn', the report on France only had 15. 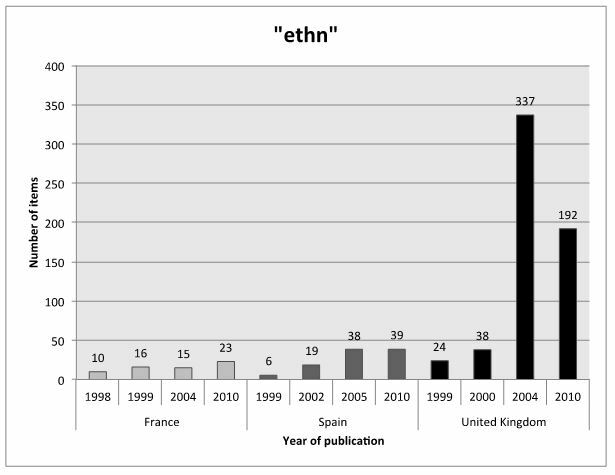 While the latter is admittedly shorter, this does not alone account for the fact that 'ethn' comes up 22 times more often in the British document. The anti-racial discrimination policy launched in the UK in the 1960s has led public authorities to use racial categories. References to those categories have since become commonplace. The comparison with Spain only reinforces this interpretation (Figure 10). 6.16 A European expert from ENAR confirmed the reluctance of France to discuss on ethnic issues, and especially to consider ethnic monitoring: 'Sure, there's a sort of resistance from the French organisations on that issue. But then our reports are based on court rulings or other things that show there are problems' (interview, Brussels, 13 January 2011). 6.17 No such resistance exists in Spain, where it is legally possible to introduce ethnic or racial categories, as an academic expert explains: 'What's happening is that until now we haven't made any. I know the problems that exist in France concerning ethnic statistics, but for us in Spain it's just a question of getting things going. The constitution doesn't forbid ethnic statistics' (interview, Computense University of Madrid, 1 March 2011). 6.18 In the UK, a teacher who works with ethnic minority students has completely internalised the use of ethnic statistics: 'In my work, I'm always collecting data. Keeping statistics, keeping records, analysing the data, you know, what's the distribution of this group or that nationality?' When we tell her that ethnic statistics are controversial in France, she says 'it's bloody-minded. It's completely short-sighted. It's like saying that everything is fine and hoping that if you say that with enough determination things will be fine' (interview, London, 7 March 2011). 6.19 There are a few other instances of uses of a vocabulary that is specific to a Member State within the framework of an originally European policy, as we can see if we observe the evolution of the occurrences of 'relig' in ECRI reports. 6.20 While the use of 'relig' has been fairly stable for Spain, it has experienced uninterrupted growth for France and the UK, with a much higher number of occurrences in the British reports, where the theme of religion is particularly prominent. The relative values in Figure10 confirm this. 6.22 In the Spanish document, the religious issue is approached in terms of access to religious instruction for Muslims. This can be explained by the fact that in the 2000s, nearly 30% of immigrants came from Africa, including a large majority of Muslims. Nevertheless, Spain, a traditionally Catholic country, has very few mosques (reportedly only a dozen actual mosques out of some 450 places of worship) and no religious instruction institutions apart from the Catholic ones (Escobar Stemman 2008). This constitutes a potential source of religious discrimination. 6.23 In the French document, a connection is made between racist and ethnic motivations. The French expert uses mostly the 'relig' root to list criteria of discrimination like in the European directive. Religion remains a private matter. However, in 2010, the adjective 'antireligious' comes up in discussion of offences. While in theory the French institutions have no say about religious issues owing to the national tradition, in practice, the courts do examine religious offences (Statham & al. 2005). 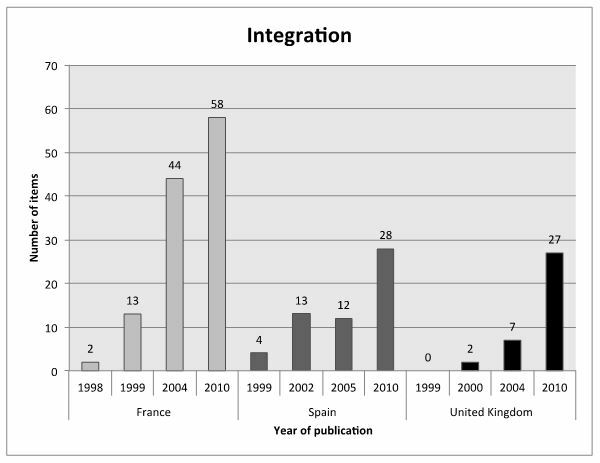 6.24 Likewise, the use of the term 'integration' appears more specific to France (Figure 12). The word is used heavily in ECRI reports on France, which shows that the French policy makes a more direct link between discrimination and integration than its British and Spanish counterparts. 'Integration', in the UK report (2010), comes up in relation to the naturalisation process or to accommodation and assistance for asylum seekers. In France, it is frequently used because several institutions also in charge of discrimination issues include this term in their name, like the Ministry of Immigration and Integration and the Supreme Council for Integration. In Spain, 'integration' features in connection to the 'reception' of immigrants, which again reflects the recent character of immigration in the country. 7.1 We have evidenced that different terminologies are used in the three Member States under study in the implementation of what is originally a European policy. National configurations have an influence on the importation of EU standards and policies. In the UK, the most frequently found roots are 'ethn', 'relig' and 'rac'. This shows that there is no taboo whatsoever surrounding the terms 'race' and 'ethnic', and the emphasis on the religious dimension is distinctive. The language used is close to that of the Racial Equality Directive. In France, we find more mentions of 'integration', 'diversity' and 'social cohesion'; the notion of ethnicity is suppressed. This reflects the discursive strategies historically used to avoid categorising the population on the basis of race, in a State that is openly universalist and secular. In Spain, it is difficult to identify a distinctive terminology. This might relate to the relatively recent character of the treatment of ethnic questions in the country: traditionally a country of emigration - which did not preclude employment discrimination for immigrants – Spain has turned into a country of immigration since the late 1990s (Delgado Godoy 2007; Larroque Aranguren 2010). In 2000, as the immigration flows were still fairly recent, the fight against discrimination did not appear as a priority. There was for instance very little integration terminology in the 1999 ECRI reports. Policy-makers draw on several 'models' without identifying with a single one in particular. 7.2 Overall, we have observed that the transposition of the Racial Equality Directive has not resulted in a genuine homogenisation of the language used in different states. Monitoring the statements produced or taken up in the political field over the medium term has allowed us to show that the implementation of the Racial Equality Directive has been far from a linear and uniform process, because the terms employed have a socio-historical depth of their own and reflect important issues. The legal transposition was carried out in the three states observed: the 'vertical' process has worked, if at a late stage in the case of Spain. However, the implementation of the Directive has varied between the States, in accordance with the principle of subsidiarity. The Europeanisation process of national standards and practices appear more complex than is suggested by the notion of 'models', which has often been favoured in the study of public policies in Europe (Mény, Muller and Quermonne 1995). The study of circulations, translations and transactions between levels of intervention requires accounting for the role of state filters in a way that is not limited to the description of monolithic 'national models'. The latter are indeed artefacts and ongoing processes, as our study of terminology choices to present integration and anti-discrimination policies has evidenced. 7.3 These so-called national models and the language that comes with them should therefore neither be too quickly endorsed nor too harshly criticised when perceived to fail. This has recently been the case of the 'British model' after the urban riots (Vertovec and Wessendorf 2010): some have reported a 'neo-assimilationist' turn in contrast with the differentialism formerly promoted (Garbaye 2011). As a result of this, we may note a relative form of convergence regarding the management of interethnic relations in the UK and in France, calling into question the binary opposition usually posited between the two models (Bleich 2012). The rise of the discourse surrounding Islam and religious differences has been another factor of convergence in the public space and in the political arena (Grillo 2010). It is however difficult to make a strict distinction between the relative influence of the different factors involved in this process, including regarding effects related specifically to the Racial Equality Directive. The embedding of all these factors is what makes sense from a sociological perspective. 7.4 Likewise, our comparative approach suggests it is important not to confuse discrimination with racism. In effect, the study of the implementation of the Racial Equality Directive has allowed us to evidence blind spots by going beyond an interpretation focused on racism. To follow the metaphor proposed by Patrick Simon (2006), achieving a finder understanding of the 'tree of racism' gives us a clearer view of the 'forest of discrimination'. This in turn enables us to avoid the pitfall of 'dodging discrimination', as in the housing policies studied by Valérie Sala Pala (2013), or of succumbing to an essentialist approach to ethnicity, when ethnicity is a principle of vision and division of the social world that varies across socio-historical contexts. 1Council Directive 2000/43/EC of 29 June, 2000, Official Journal L 180, 19 July, 2000. On the making of the Directive, see Guiraudon (2004). 2European directives set objectives that Member States are to meet by using the means of their choice, which means they must be transposed into national law within a specified time limit. 4For a critical analysis of these categories, see Sala Pala (2013) and studies on the multiculturalism backlash in the UK (Grillo 2010). 6The ECRI's reports are generally available in several languages, in part due to the process of their production: the organization calls on national experts to produce documents which are then translated for all countries concerned and disseminated in several languages. For the purposes of this research, we have systematically used the French versions of the ECRI's reports: UK reports: http://www.coe.int/t/dghl/monitoring/ecri/Country-by-country/United_Kingdom/UnitedKingdom_CBC_fr.asp France reports: http://www.coe.int/t/dghl/monitoring/ecri/Country-by-country/France/France_CBC_fr.asp Spain reports: http://www.coe.int/t/dghl/monitoring/ecri/Country-by-country/Spain/Spain_CBC_fr.asp On the other hand, the 'National strategy and priorities' documents are published either in French, English or Spanish depending on the country. We made sure that the English translation of the terms selected for the purposes of this research was consistent by checking both versions in order to avoid possible translation-related biases. 7Special Eurobarometer 296, report published in July, 2008. 8The European Network Against Racism, a group of NGOs, has positioned itself as a human rights lobbying organisation. 9Message from the President of ENAR, Shadow Report 2009-2010, Racism in Europe. 10Established by the law of 30 December, 2004, the HALDE was the institution specialised in the fight against discrimination in France until its dissolution on 1 May, 2011. The HALDE's missions have been taken over by the Défenseur des Droits, who is assisted by a 'Collège' in charge of discrimination and equality issues. 12Special Eurobarometer 317, report published in November, 2009, p. 29. 14This colloquial term is used to refer to young French people with parents of North African origin. 18The search engine works with root words. By entering the item 'discrimin', we were able to count occurrences of the following words: discriminated, discriminate, discrimination, discriminatory, etc. 19They died of electrocution on 27 October, 2005, after hiding in a power substation while fleeing the police. 21In 1994, a research by a collective of sociologists (IOE 1994) showed that 357% of Moroccan immigrants faced employment discrimination in the service sector. However, no inequalities were evidenced in other sectors, such as construction. 22As Philippe Poutignat and Jocelyne Streiff-Fénart (1995: 17) point out, 'theorising ethnicity is not about holding up ethnic pluralism as a model of socio-political organisation, but about examining the modalities according to which an "ethnic" worldview is made pertinent for the actors'. BERENI, L and Chappe, V A (2011) 'La discrimination, de la qualification juridique à l'outil sociologique', Politix, No.94, p.7-34. BERENI, L and Jaunait, A (Eds.) (2009) Special issue 'Usages de la diversité', Raisons politiques, No.35. BLANC, M (1990) 'Du logement insalubre à l'habitat social dévalorisé. Les minorités ethniques en Allemagne, France et Grande-Bretagne', Annales de la recherche urbaine, No.49, p.37-48. BLANC, M (2003) La ségrégation ethno-résidentielle dans l'Union européenne: quelles transactions sociales? in Boumaza N (Ed.) Relations interethniques dans l'habitat et la ville, Paris: L'Harmattan, p.289-299.
. BLEICH, E (2012) Les politiques de diversité raciale en France et en Grande-Bretagne: de l'incompréhension mutuelle à la concertation? in Cohen J, Diamond AJ and Vervaecke P (Eds.) L'Atlantique multiracial. Discours, politiques, dénis, Paris: Karthala, p.181-203. BORRILLO, D (2003) La politique antidiscriminatoire de l'Union européenne in Borrillo D (Ed.) Lutter contre les discriminations, Paris: La Découverte, p.139-152. CALVÈS, G (2002) 'Il n'y a pas de race ici, le modèle français à l'épreuve de l'intégration européenne', Critique internationale, No.17, p.173-186. CARLES, I (2008) 'L'élaboration des politiques publiques de lutte contre les discriminations raciales: trois exemples européens', Asylon(s), No.5: http://www.reseau-terra.eu/article810.html. CHEVALLIER, J (2003) Lutte contre les discriminations et États-providence in Borrillo D (Ed.) Lutter contre les discriminations, Paris: La Découverte, p.38-54. CROSS, M and Keith, M (Eds.) (1993) Racism, the City and the State, London: Routledge. CROWLEY, J (1992) Consensus et conflit dans la politique de l'immigration et des relations raciales du Royaume-Uni in Costa-Lascoux J and Weil P (Eds.) Logiques d'État et immigration, Paris: Kimé, p.73-110. DELGADO GODOY, L (2002) La política de inmigración: la importancia de Europa en la elaboración de la agenda nacional in Grau M and Mateos A (Eds.) Análisis de políticas publicas en España: enfoques y casos, Valencia: Tirant lo Blanch, p.95-136. DELGADO GODOY, L (2007) Argumentación gubernamental y política de inmigración in Zapata-Barrero R and van Dijk TA (Eds.) Discursos sobre la inmigración en España: los medios de comunicación, los parlamentos y las administraciones, Barcelona: Fundación CIDOB, p.201-222. DHALIWAL, S (2011) Religion, Moral, Hegemony and Local Cartographies of Power: Feminist Reflections on Religion in Local Politics, Doctoral thesis, Goldsmiths: University of London. ÉLIAS, N (1965) The Established and the Outsiders. A Sociological Inquiry into Community Problems, London: Frank Cass & Co.
ESCOBAR STEMMAN , J (2008) 'Activismo islámico en España', Politica Exterior, No.124: http://www.revistasculturales.com/articulos/25/politica-exterior/930/2/activismo-islamico-en-espa-a.html. FRANK, C and Hamman, P (2014) Quelle mise en oeuvre de la directive européenne contre les discriminations raciales? Une comparaison France, Espagne, Royaume-Uni, Bruxelles: De Boeck. GARBAYE, R (2011) Émeutes vs intégration. Comparaisons franco-britanniques, Paris: Presses de Sciences Po. GARCÍA FLÓREZ, D (2002) La politica española de inmigración en el marco de la Unión in Inmigración y seguridad en el Mediterráneo: el caso español, Madrid: Ministerio de Defensa, Secretaria General Técnica. GEDDES, A and Guiraudon, V (2006) The Europeanization of Anti-Discrimination in Britain and France in Bertossi C (Ed.) European Anti-Discrimination and the Politics of Citizenship. Britain and France, New York: Palgrave, p.125-142. GRILLO, R (2010) British and Others. From 'Race' to 'Faith' in Vertovec S and Wessendorf S (Eds.) The Multiculturalism Backlash. European Discourses, Policies and Practices, London: Routledge, p.50-71. GUIRAUDON, V (2004) 'Construire une politique européenne de lutte contre les discriminations: l'histoire de la directive "race"', Sociétés contemporaines, No.53, p.11-32. HAGUENAU-MOIZARD, C (1999) 'La lutte contre le racisme par le droit en France et au Royaume-Uni', Revue internationale de droit comparé, Vol.51, No.2, p.347-366. HAMMAN, P (2013) Sociologie des espaces-frontières, Strasbourg: Presses universitaires de Strasbourg. IOE (1994) 'La discriminación laboral a los trabajadores inmigrantes en España', Estudios sobres migraciones internacionales, No.9: Discursos de los españoles sobre los extranjeros. Las paradojas de la alteridad, Estudio núm. 2119, Madrid: Centro de Investigaciones Sociológicas. KOKOREFF, M, Steinauer, O and Barron, P (2007) 'Les émeutes urbaines à l'épreuve des situations locales', SociologieS, 18 July: http://sociologies.revues.org/254. LARROQUE ARANGUREN, J (2010) Des stratégies d'appropriation des modèles d'intégration par les Communautés autonomes en Espagne. 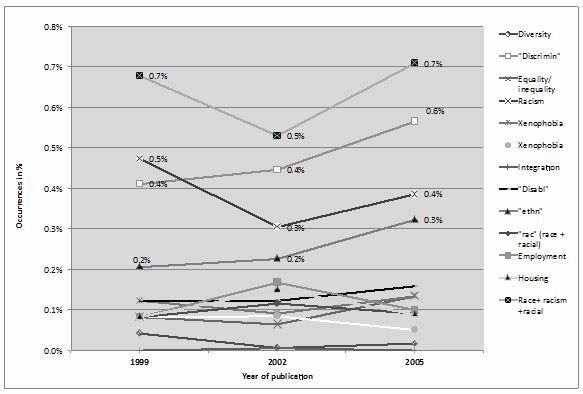 Une étude comparative des politiques d'intégration des étrangers en Catalogne et au Pays Basque (2000-2009), Ph.D. in Political Science, University of Montpellier I.
LASSALLE, D (2006) 'Question ethnique et question religieuse dans le recensement de la population britannique de 2001: polémiques et enseignements', Revue européenne des migrations internationales, Vol.22, No.1, p.133-152. LATRAVERSE, S (2005) 'Tradition française et politique européenne de lutte contre les discriminations', Informations sociales, No.125, p.94-102. LEMOSSE, M (2003) 'Les Anglais et le multiculturalisme', Cahiers de l'Urmis, No.6: http://urmis.revues.org/321. LORCERIE, F (2000) 'La lutte contre les discriminations ou l'intégration requalifiée', Ville École Intégration Enjeux, No. 121, p. 69-81. MASCLET, O (2012) Sociologie de la diversité et des discriminations, Paris: Armand Colin. MARCHAL, H and Stébé, J M (2010) La diversité en France: impératif ou idéal?, Paris: Ellipses. MÉNY, Y, Muller, P and Quermonne, JL (Eds.) (1995) Politiques publiques en Europe, Paris: L'Harmattan. NEVEU, E (1994) Une société de communication?, Paris: Montchrestien. PERES, H (2009) Les politiques de la 'diversité' entre 'modèles' nationaux et convergences européennes. Réflexions comparatives sur les cas français, britannique et espagnol in Camau M and Massardier G (Eds. ), Démocraties et autoritarismes. Fragmentation et hybridation des régimes, Paris: Karthala, p.261-179. PERES, H (2010) Towards the End of National Models for the Integration of Immigrants in Europe? Britain, France and Spain in Comparative Perspective in Luedtke A (Ed. ), Migrants and Minorities: The European Response, Newcastle: Cambridge Scholars Publishing, p.272-310. POUTIGNAT, P and Streiff-Fénart, J (1995) Théories de l'ethnicité, Paris: Presses universitaires de France. SAFI, M and SIMON, P (2013) 'Les discriminations ethniques et raciales dans l'enquête Trajectoires et Origines: représentations, expériences subjectives et situations vécues', Économie et Statistique, No. 464-465-466. SALA PALA, V (2013) Discriminations ethniques. Les politiques du logement social en France et au Royaume-Uni, Rennes: Presses universitaires de Rennes. SALA PALA, V (2010) 'Faut-il en finir avec le concept de racisme institutionnel? ', Regards Sociologiques, No. 39, p. 31-47. SALES, R (2007) Understanding Immigration and Refugee Policy. Contradictions and Continuities, Bristol: The Policy Press. SARTORI, G (1994) 'Bien comparer, mal comparer', Revue internationale de politique comparée, Vol.1, No.1, p.19-36. SAYAD, A (1999) La double absence: des illusions de l'émigré aux souffrances de l'immigré, Paris: Seuil. SIMON, P (2005) 'La mesure des discriminations raciales: l'usage des statistiques dans les politiques publiques', Revue internationale des sciences sociales, No.183, p.13-30. SIMON, P (2006) L'arbre du racisme et la forêt des discriminations in Guénif-Souilamas N (Ed.) La République mise à nu par son immigration, Paris: La Fabrique, p.160-177. SIMON, P (2007) 'Comment la lutte contre les discriminations est passée à droite', Mouvements, No.52, p.153-163. SIMON, P and Sala Pala, V (2010) 'We're not all Multiculturalists Yet': France Swings Between Hard Integration and Soft Anti-Discrimination in Vertovec S and Wessendorf S (Eds.) The Multiculturalism Backlash. European Discourses, Policies and Practices, London: Routledge, p.92-110. STATHAM, P and Koopmans, R (2005) Multiculturalisme, citoyenneté et conflits culturels: le défi posé par les revendications des groupes musulmans en Grande-Bretagne et aux Pays-Bas in Arnaud L (Ed.) Les minorités ethniques dans l'Union européenne, Paris: La Découverte, p. 139-163. VERTOVEC, S and Wessendorf, S (Eds.) (2010) The Multiculturalism Backlash. European Discourses, Policies and Practices, London: Routledge. WEIL, P (1995), La France et ses étrangers. L'aventure d'une politique de l'immigration de 1938 à nos jours, Paris: Gallimard. WIHTOL DE WENDEN, C and Leveau, R (2001) La beurgeoisie. Les trois âges de la vie associative issue de l'immigration, Paris: CNRS éditions. WOEHRLING, J M (2008) 'Le droit français de la lutte contre les discriminations à la lumière du droit comparé', Informations sociales, No.148, p.58-71.